Fresh Barramundi is such a succulent fish. I have always found it best to keep its preparation and cooking to a minimum, so its natural flavour can be enhanced and appreciated. I’m sure this simple recipe will become a favourite. In a small bowl add 1 tablespoon of butter and oil – mix until softened. Add the chopped basil leaves and mix well to bruise the leaves. Heat a non-stick frying pan on high then add the remaining butter and the juice of 1 lime or lemon – stir until melted and hot. Add the fish and season with salt and pepper. Now add the basil butter mix. Divide and pour the juice from the last lime over each piece of fish. Reduce heat to medium and turn fish after about 3 minutes of cooking (may need a little longer if fillets are very thick). Fish should look golden. Cook on this side for another 3 minutes. Remove pan from the stove and allow to rest for a minute or so. 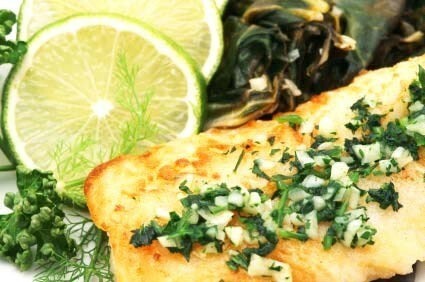 Transfer fish to warmed plates – sprinkle the remaining basil on to the top of each piece of fish along with a little of the lime burnt butter. Serve with garden salad or steamed vegetables. Preparation and cooking time 10 – 15 minutes.